These maps were built using a toolkit created in collaboration between GreenInfo Network, PlantRight, Cal-IPC, and Agricultural Sustainability Institute at UC Davis. 1. Has the species (or cultivar or variety, if applicable; applies to subsequent "species" questions) become naturalized where it is not native? P. wallichii is naturalized in California in 3 counties according to Calflora. It is also naturalized in Washington, Oregon, Monatana and Massachusetts in the United States, and Canada, Europe and New Zealand. [Anonymous] (2014). USDA-NRCS Plants Database. [Anonymous] (2007). CABI Invasive Species Compendium. GBIF (0). Global Biodiversity Information Facility (GBIF). 2. Is the species (or cultivar or variety) noted as being naturalized in the US or world in a similar climate? P. wallichii is naturalized in California in 3 counties according to Calflora. It is also naturalized in Washington, Oregon, Monatana and Massachusetts in the United States, and Canada, Europe and New Zealand. It occurs in a climate that matches California in Washington and Oregon. -IPC, C. (2016). Cal-IPC global map of climate areas matching California. 3. Is the species (or cultivar or variety) noted as being invasive in the U.S. or world? P. wallichii is reported as invasive in its native range in northern India (Kala and Shrivastava, 2004), as well as in its non-native range in Belgium and the UK (CABI). In the western USA it is a declared noxious weed in the states of Montana, California, Washington and Oregon (CABI). Kala, C. Prakash, & Shrivastava R. J. (2004). Successional changes in Himalayan alpine vegetation: Two decades after removal of livestock grazing. Weed Technology. 18, 1210–1212. 4. Is the species (or cultivar or variety) noted as being invasive in the US or world in a similar climate? P. wallichii is reported as invasive in its native range in northern India (Kala and Shrivastava, 2004), as well as in its non-native range in Belgium and the UK (CABI). In the western USA it is a declared noxious weed in the states of Montana, California, Washington and Oregon (CABI). In Washington "It grows vigorously into dense colonies that exclude native vegetation, alters natural ecosystems and is difficult to eradicate. It poses a significant threat to riparian areas, where it can survive severe floods. Small fragments can form new plants." Some of the Washington P. wallichii distribution matches the climate in California. Noxious Weed Control Board (2010). Washington State Noxious Weed Control Board. 5. Are other species of the same genus (or closely related genera) invasive in a similar climate? Fallopia japonica (Polygonum cuspidatum), Fallopia sachalinensis (P. sachalinense), and P. polystachyum (former name of Persicaria wallichii) are all considered invasive in the Pacific Northwest and occur in climates which match California's. Soll, J.. (2004). 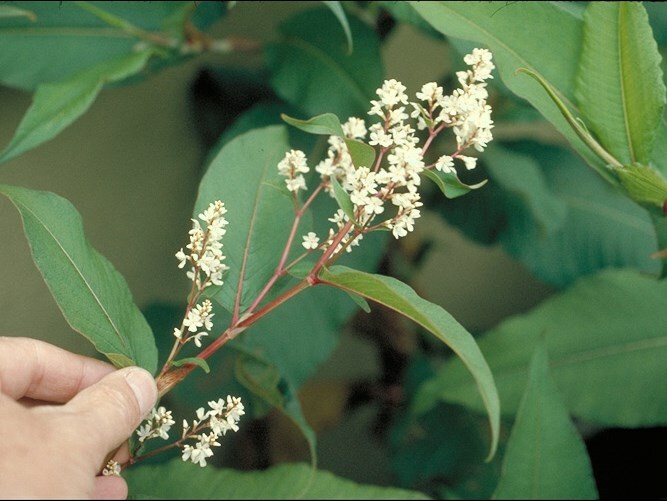 Controlling knotweed (Polygonum cuspidatum, P. sachalinense, P. polystachyum and hybrids) in the Pacific Northwest..
6. Is the species (or cultivar or variety) found predominately in a climate matching the region of concern? Although there are locations in Washington and Oregon which match California's climate, most of the other locations (northern Europe and New Zealand), do not match California's climate. 7. Does this plant displace native plants and dominate (overtop or smother) the plant community in areas where it has established? It grows vigorously and creates large and dense stands that exclude native vegetation and prevent tree seedlings from growing. P. wallichii can greatly alter natural ecosystems and promotes the erosion of river banks. In Washington "It grows vigorously into dense colonies that exclude native vegetation, alters natural ecosystems and is difficult to eradicate. It poses a significant threat to riparian areas, where it can survive severe floods. Small fragments can form new plants." 8. Is the plant noted as promoting fire and/or changing fire regimes? There is no information on whether P. wallichii promotes or changes fire regimes. 9. Is the plant a health risk to humans or animals/fish? Has the species been noted as impacting grazing systems? P. wallichii is not listed as toxic on reference websites. In some cases goat grazing is used for control of the species. 10. Does the plant produce impenetrable thickets, blocking or slowing movement of animals, livestock, or humans? P. wallichii grows as high as 6 feet and can form impenetrable thickets along streams and in wet areas. Canes from previous years can persist and could also block movement. 11. Does this species (or cultivar or variety) reproduce and spread vegetatively? Small fragments can form new plants. 12. If naturally detached fragments from this plant are capable of producing new plants, is this a common method of reproduction for the plant? 13. Does the species (or cultivar or variety) commonly produce viable seed? P. wallichii has bisexual, insect-pollinated flowers and reproduces sexually by seeds in its native range. Several sources (DiTomaso and Healy, 2007; Ison, 2011) report that seed production is rare in California, British Columbia and the UK. 14. Does this plant produce copious viable seeds each year (> 1000)? Several sources (DiTomaso and Healy, 2007; Ison, 2011) report that seed production is rare in California, British Columbia and the UK. Therefore seed production would be low if it occurs in California. DiTomaso, J. M., & Healy E. A. (2007). Weeds of California and Other Western States. 1760. Ison, J. (2011). Himalayan knotweed, Persicaria wallichii factsheet. 15. Is there significant germination (>25%) of seeds the next growing season, with no requirement of an infrequent environmental condition for seeds to germinate (i.e. fire) or long dormancy period? Several sources (DiTomaso and Healy, 2007; Ison, 2011) report that seed production is rare in California, British Columbia and the UK. Therefore chance of significant germination is low. 16. Does this plant produce viable seed within the first three years (for an herbaceous species) to five years (for a woody species) after germination? Several sources (DiTomaso and Healy, 2007; Ison, 2011) report that seed production is rare in California, British Columbia and the UK. There is no information available on when viable seed is production begins in California or elsewhere. 17. Does this plant continuously produce seed for >3 months each year or does seed production occur more than once a year? The flowering period of P. wallichii is August to September, and it sets fruit from September until October. 18. Are the plant’s propagules frequently dispersed long distance (>100 m) by mammals or birds or via domestic animals? Means of dispersal include wind, water, animal movements, translocation by humans or accidental transport by human agency. 19. Are the plant’s propagules frequently dispersed long distance (>100 m) by wind or water? Seeds of P. wallichii are dispersed by wind and water, while rhizome and stem fragments are dispersed in waterways or by flooding. 20. Are the plant’s propagules frequently dispersed via contaminated seed (agriculture or wildflower packets), equipment, vehicles, boats or clothing/shoes? Means of dispersal include wind, water, animal movements, translocation by humans or accidental transport by human agency. Stem or root fragments can be spread in contaminated fill material (Soll, 2004). Click on the button below to mark this evaluation as "Reviewed". Once you click the button, please wait a second, and the site will return to this Evaluation and your name will be on the "Reviewers List" in the right hand column (below the Evaluation Summary). For more information, please see the help page on How to Review an Evaluation? The PRE Score is calculated by adding the point totals for each (answered) question. It is important to answer at least 16 questions to consider a PRE Score as "valid".